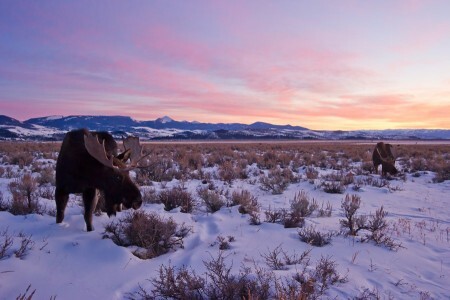 As the sun sinks lower over the silhouette of the southern Tetons, temperatures plummet to minus 12o F. The dry and crusted snow crunches loudly in the still air as two bull moose search for antelope bitterbrush growing among the sage. The last rays of sun paint the thin layers of cirrus clouds whose colors mix with the blues of evening. Bulls gather in bachelor herds here on the flats during October and November. With the rut passed, energies depleted and hormones waning, the bulls concentrate on gaining fat reserves for the long winter. When the heavy January snows pile up, covering the bitterbrush plants, the moose will move to the Gros Ventre and Snake River bottoms where great stands of tall willows grow, readily accessible to the longest legged member of the deer family.